Haters love to complain that this increasingly barmy petrolhead action series has reached its eight episode with no sign of stopping. But would the same argument apply to, say, a decades-long TV soap opera? 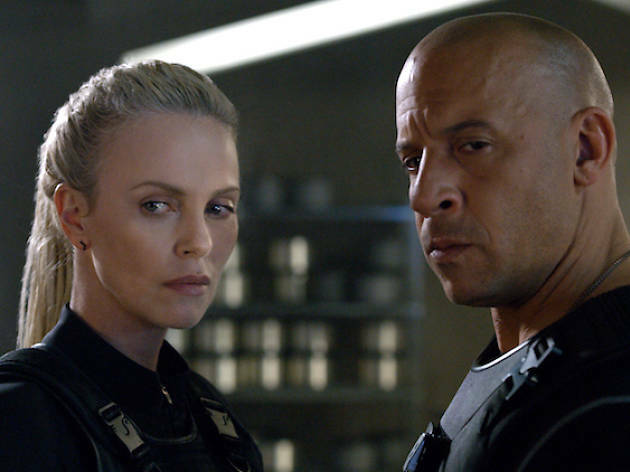 Deep down, that's all the Fast & Furious franchise is – it just happens to be on the big screen, cost millions of dollars and feature souped-up sports cars jumping over submarines. The villain this time is Cipher (Charlize Theron), a platinum blonde criminal mastermind (aren’t they all?) with a cunning plan to bring Dominic Toretto (Vin Diesel) back to the dark side. But Letty (Michelle Rodriguez), Hobbs (Dwayne Johnson) and the rest of their ever-expanding crew of wiseass jalopy jockeys have no intention of letting Dom go. He’s family, goddammit! So begins the obligatory globe-trotting free-for-all, as our heroes abandon their bolthole in Havana and head briefly to Berlin, followed by a wild time on the streets of New York and a sub-smashing showdown in an Arctic shipyard. Of course, there are strays to pick up along the way: Scott Eastwood’s buttoned-up military man, Kurt Russell’s shady government fixer and – gloriously, hilariously – Helen Mirren as Jason Statham’s drawling, nicotine-stained Cockney mum. The action scenes are competently handled by ‘Straight Outta Compton’ director F Gary Gray: there’s nothing here to rival the tactile intensity of series peak ‘Fast Five’, though the New York sequence has its share of OTT grip-the-handrest moments. 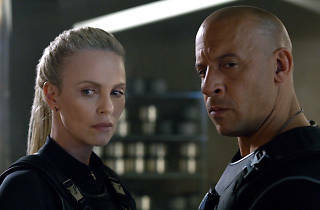 Overall, there’s a sense that ‘Fast and Furious 8’ knows exactly where it wants to go and won’t bust a gasket getting there: you might ask for a little more character work here, a few more plot surprises there, but on the whole this rattles along just fine. Fast And Furious 8 (aka The Fate of the Furious) takes sequels to the next level. I mean it's the 8th Fast and Furious film. 8th! How could it possibly not be good, when it comes from such solid stock? Your enjoyment of the latest in the franchise is likely to depend on how seriously you take the whole thing. As a comedy, it's top notch. The dialogue pokes fun at itself, the actors are having a great time, and it's all so ludicrous you can't help but laugh - pretty much the whole way through. As an action film, it's majorly lacking in tension, believability and plot consistency. There are some fine and original chase scenes, and it's excellent at melding action sequences with a great soundtrack - but these offer excitement rather than thrills. The cast is varied and strong, from the self-referential cavorting of Vin and the Rock, to a surprise turn from Helen Mirren. It's not going to win any awards, but it was one of the funnest evenings I've ever had in a cinema.